We sit writing this entry from what has been touted to be the most dangerous city in the world, Buenaventura, Colombia. This city is Colombia's only port on the Pacific Ocean and has a long and fairly ugly history of severe violence, poverty and drug trafficking. At present it seems to be pretty calm, although still showing many scars and still certainly to a place where one wouldn't want to spend much time after dark... But, If anything it is probably a testament to the incredible human capacity for adversity in the face of crisis and trauma...for life goes on here, like anywhere else. We have ended up in this city after a long boat journey from Panama City, in an attempt to circumvent the infamous Darien Gap where there are no through roads. It was quite the trip, taking long rides on cargo boats, encountering heavily militarized villages, hearing machine guns, and visiting some pretty spectacular towns where the legacy of war is fresh. All in all we are happy to be on solid grounds and looking forward to getting back on the bicycles. Travelling from Panama To Colombia on the Pacific Ocean side is not too common. It was actually my dad who first conceived of taking this route. He and his good friend Neil's have trekked through the Darien twice and the plan was for them both to come and lead us through (albeit mostly on boat due to the small detail of having bicycles). Unfortunately to my dad's extreme annoyance and our huge disappointed at the very last minute he was not able to join us... So that left us, Neils and a new bicycle riding friends Zack to complete the journey. Neil's spent a week in Panama City before we arrived doing research, and discovered that the best (and maybe only) option on the Pacific side was to take a weekly cargo boat to the town of Jaque. As it turned out, this boat left the day after we arrived in Panama City. We scrambled to get ready for a journey of an unknown length and into unknown territory... But by Thursday evening on January 17th we were ready to go and waiting at the dock. We were surprised to actually leave within a couple of hours of the time we had been given. 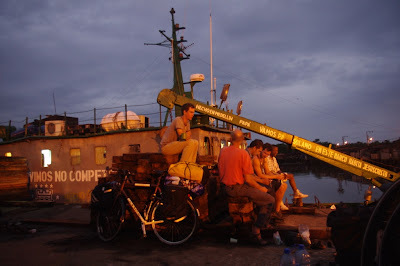 The boat, it turned out, was anchored out at sea and the many many passengers were shuttled out to it in the dark by lanchas (small motor boats), luckily our bikes has been preloaded. We, very stupidly it turns out, did not push and shove our way to the front of the line and ended up in the last lancha. When we arrived at The Victoria, it was packed to the brim, with cargo, people, babies, puppies... People were sprawled out over just about everything and squeezed into every corner. It was going to be a long night. I found a seat, the only one left, beside a young police officer... One of the three who would be guarding our boat for us. His machine gun rested casually between his knees. We chatted for some time and eventually I got curious about where Glenn was, he is especially good at finding good spots in these situations. He had found a 'good' spot in a big tire on the bow of the boat, so I squeezed in beside him. Eventually Neils and Zack came down and found slivers of space beneath the moto pick-up and a gas cylinder... Safety first. Like everything, the night passed. We woke to beautiful views of the Darien coastline and occasional schools of dolphins playing off the bow of the boat. It was pretty magical and before we knew it were had arrived in Jaque... Well, almost. The cargo boat cannot get into the town, because there is no dock... So a lancha came and met us and we somehow hauled the bikes and ourselves onto it in the rocking water. The lancha then sped over a sand bar and into the port... And in this little village with only boat access and a huge military presence, we spent our last night in Panama. As soon as we arrived in Jaque negotiations started for the next leg. There are no cargo boats that take this route, only lanchas...which are much faster, but a little more intense if the water is rough. The two captains in town willing to do this trip (which comes with some risks, we would find out) had a little healthy competition and we finally settled with Walter...who turned out to be pretty great. There were about ten others who had been on the cargo boat and wanted to go to either Jurado, the next town along, or Bahia Solano where we would go. So, at six a.m. on January 19th, a motley crew assembled at the shore. Our bags were lined up, sniffed by a dog and searched by a human. Our passports, which had been held by the immigration officer overnight, were returned with Panama exit stamps, and we piled into the lancha. We made good time to our first stop of Jurado, where about four passengers got off. The rest of us were told to go into town to the immigration office, as we were now in Colombia. Very unfortunately somewhere between Jaque and Jurado Neils had lost his passport. Yes, that is right, he lost it in no man's land before crossing one of the toughest borders in the world. It was not an ideal situation... Neils explained himself calmly to the immigration officer and the captain. The young new immigration officer was kind, but explained the rules are clear: no passport, no entry. It looked as if Neils would need to wait in Jurado for a boat back to Jaque and back to Panama City, and just hope that they would let him back in. Then, one of our fellow passengers suggested that we really ought to go back and check the boat for the passport, a very wise idea it turned out, for when Glenn and Zack returned to take a look it was sitting right there... Where Neils' feet had been. We were all very relieved and quickly piled back into the boat as the lancha was trying to make it to Bahia Solano in time for some of the passengers to get on a cargo boat to Buenaventura that was leaving that afternoon. But...one of the motors on the boat would not start. Our captain Walter had sweat pouring down his face trying to get the thing going, and folks came to help... But no luck. Then, as he was tugging away and we were all sitting in the boat helplessly, we hear shots... Machine gun shots. We had no idea where it was coming from, and the fact the the village had a military fortress around it did not do a whole lot to ease my mind. Several rounds of machine gun shots went off... And they were hitting the water right in front of us! The captain and first mate started yelling up to the military, and it turned out that they were the ones shooting... And then the drunk passanger on our boat started swearing at the military...eek! We are still not sure why they were shooting, whether it was because they wanted us to move on or whether it was a warning to some other boat trying to come in or getting too close, but one thing is for sure - we were pretty ecstatic when the motor started going again and we got out of there! We arrived in Bahia Solano just as a cargo boat to Buenaventura was leaving the Bay, the captain was able to intercept it and a couple of the passengers climbed aboard. We opted to stay in Bahia for a little while and take a short break from being on boats ... And our stay in Bahia ended up being just under a week as we waited for another cargo boat to arrive. But, it was a neat little town and we even had the pleasure of riding our first kilometres in South America as there was an 18 km road connecting Bahia to another little village. When we finally arrived into the huge port of Buenaventura we passed giant ship after ship, and made our way to the very end of the port. The tide was very low by the time we arrived and the boat sort of slid into the mud. The dock was about 15 feet above the boat, so there was no way we could get off. Some passengers did get off with the help of a lancha, but we would not have been able to get the bikes off that way...plus it was getting quite late in a city that is known to be dangerous at night. So, we spent another night on the boat and got up at 4:30 am when the tide was high again to get ourselves and the bikes off the boat! We made some coffee on the dock as we waited for the sun to rise and then rode into town to look for a place to stash our stuff and our bikes. So, here we are at the beginning of the South American leg of our journey... Rearing to Go!